The tobacco cards, or T-cards, are some of our favorite Pre-War baseball cards here at DeansCards.com, but since they haven't been manufactured in over a century, it can be difficult to picture these little scraps of cardboard in their brand-new form. Fortunately for us, we came across a few Recruit cigarette boxes sitting in our Non-Sports inventory and we figured out exactly what they were. 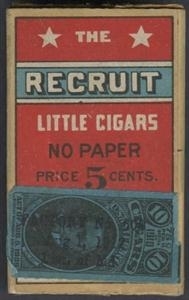 The Recruit Cigarette brand was owned by the American Tobacco Company, which owned dozens of cigarette brands in the first decade of the 20th century. The front of boxes themselves have brand name Liggett & Myers Company, which had been purchased by the American Tobacco Company several years earlier. 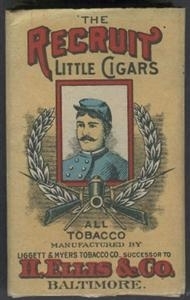 The T207 cards were one of the last sets to be produced before the American Tobacco Company was dissolved due its monopoly on the tobacco industry. The Recruit back is the most common for the T207 cards, but there are also Broadleaf, Cycle, Napoleon, and Red Cross back variations. When we originally found these boxes, we were hoping to find "pack fresh" T207 cards, but instead we found several dozen T59 Flags of All Nations cards. These Non-Sports cards are very interesting, but are much more common than high-grade T207 cards. One of our favorite resources for cigarette card information, including the containers or boxes in which cigarette cards were originally placed, is baseballandtobacco.com. Those are very old cigarette boxes. If I'm a cigarette box collector, I'll probably get one of those because they look unique.